We had a good turnout of members for our this meeting. Unfortunately Mike was unable to attend and give the programmed presentation on ramification of pines. Trees had been brought to the meeting and members rallied to the challenge of not having a formal meeting on this occasion. Conducting the session among themselves, they discussed work on their trees and the more advanced members gave instruction and practical help with the trees of novice members. It was an unplanned meeting and a very good event. Thank you to Les, Frank and Alan Moore who assisted others with their technical know-how. A travel report from Carol, who missed our meeting, but had a great time in Chicago. Another very large local event with lots to see and do. The sun shone again and there was a good turnout from the public. Our Chairman Frank Mepham used to put on a display made up of only his own tree in the past, but failing health meant that he had to enlist some help for this year. Mike agreed to help out and together they put on a great display for the public, resulting in keen interest shown by the public and many inquiries about the club. Hopefully new members will result. Huge thanks go to Frank Mepham who, in spite of poor health, organised this event. Below are some pictures of the dispaly, but I have to apologise in advance for the quality of the pictures. The event was held in a marquee, so the light was not ideal and the fact that I had to take them on my phone rather than with a camera compounded the problem. Our Secretary, Mike Konig, gave a presentation to members on Basic Horticultural Practices and Principles related to Bonsai Cultivation. He concentrated on the basic aspects of maintaining both pre bonsai material and show ready bonsai in a healthy and vigorous candition. While the evening din’t really lend itself to taking photos (I will spare you the view of Mike standing next to a flipchart talking), the presentation proved to be a very interesting and informative for members of all experience levels. It opened a window on the knowledge and understanding on how important it is to maintain the good health of a growing tree in order for it to be able to withstand the stress of being turned into a bonsai. It also highlighted that knowing (or being able to predict) how a particular tree will react to work carried will make planning the artistic manipulation of developing a good bonsai much easier and faster. It takes time, practice, observation and patience to understand the horticultural elements,but knowing your trees will reap rewards. A novice club member remarked it was invaluable information andthat we are lucky to have been given the opportunity to share the knowledge and experiences one of our own members. The annual Family Open day and Plant sale is a very popular event with plenty of plant stalls and other activities. 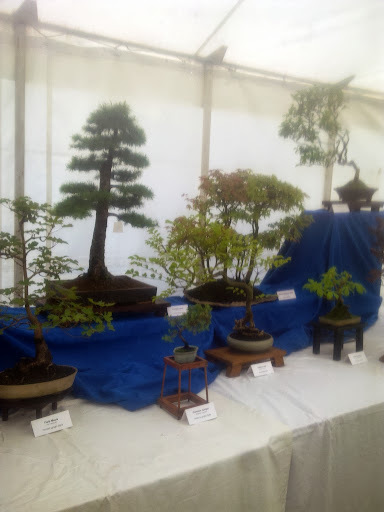 The good weather brought out the crowds and the Club put on a nice display of members bonsai and accent plants. A big thank you to all members of the club and especially to Alan Moore, Mike, and Maureen for organising the display. The trees were well prepared and the comments of the visitors reflected this. As part of the exhibition, members nominate two of their trees to be entered into a competition. These trees are then voted on by the visiting public to determine the tree with the most popular appeal. Lee Bolton swept the board on this occasion, with his 8 year old Red Maple ‘Bloodgood’ Group and a magnificent 15 year old Deshojo Maple. 3rd prize went to Mike Konig for his informal Upright Juniper. I am still trying to collate all the pictures from the show and will add these in a separate post at a later date. My sincere apologies for the lack of updates since the end of June. IT problems (namely a dead computer) and other commitments prevented me from updating the site. I will update the site later today with reports of what was a very busy period for club members.